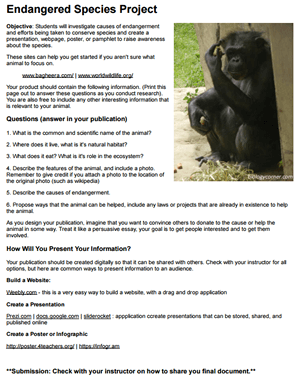 This project asks students to create a publication (website, infographic, or prezi) to educate their classmates about a specific animal that is on the endangered species list. Students can choose their animal and the format for their publication, though project guidelines ask them to address specific questions, such as habitat, causes of endangerment, and efforts to save the species. The publication is a shareable document that can be shared with the class. I also ask students to vote on which presentation was the most compelling and we donate funds to that organization. The project can also be altered to require students to present their animal to the class. Thank you for such amazing resources. Do you have a rubric for the endangered species project? I do have one somewhere, I’ll put it on my to-do list to post it. I’m actually surprised I haven’t already included it. Thanks for the heads-up!